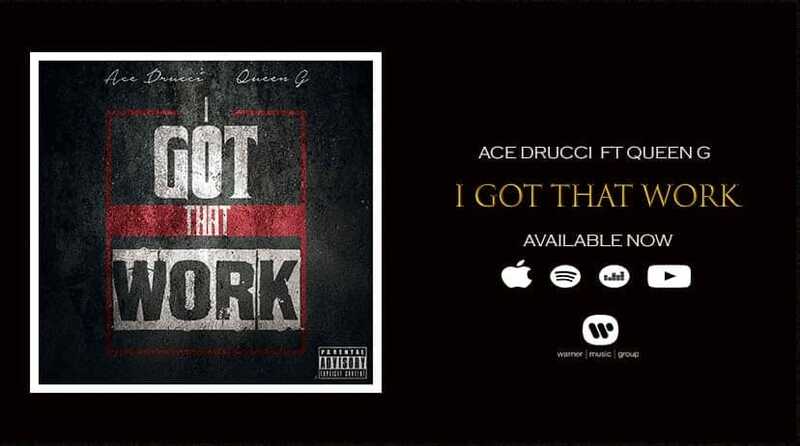 Rap music’s Renaissance man Ace Drucci continues his relentless hit parade with a new single titled I Got That Work featuring Queen G. Drucci has been hard at work since the release of his critically acclaimed album The Hustle back in May 2018, which I had the honor of reviewing. Originally from the Washington D.C. area, the multi-talented Drucci is an equally accomplished artist and producer that puts his heart and soul into everything he does. Released by Warner Music Group (International), I Got That Work is a funky rap tune and an instant winner for fans of the genre. Drucci’s impeccable flow works brilliantly with the fire-trodden beat that proves to be a delicious ear-candy anthem for the streets. Queen G, also from the Washington D.C area, adds a boost of estrogen to I Got That Work’s braggadocios theme with a captivating and cinematic performance. I Got That Work (feat. Queen G) is Ace Drucci’s masterpiece is good music that is perfect for overtime Hip Hop devotees made real.